You’ve no doubt noticed that I have a great love for homemade stock. It’s one of the most widely useful elements in any kitchen. It also has some very real health benefits. We’ve already discussed it in braising and soups and no doubt it’ll come up even more in the future. First, what is the difference between stock and broth? Broth is liquid that is the result of boiling meat and/or vegetables for an extended period of time to extract and concentrate their flavor. Stock, on the other hand, specifically requires the boiling of bones. 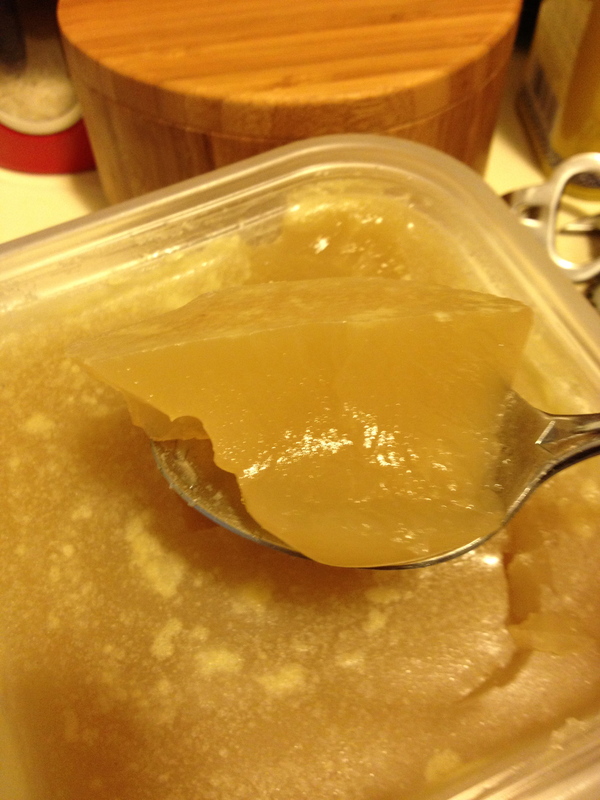 From the bones, you get gelatin which changes the texture of the liquid substantially. It can give a fuller body to soups and sauces. Gelatin also has a number of really great health properties. In addition to being good for skin, nails, and hair, it’s a protein bomb and can be useful in stemming some of the less savory aspects of the flu. So at its core, this entry is going to be a no-brainer. You just pick a day you’ll be hanging out at home and then boil the crap out of something until you get a tasty liquid. It’s up to you how detailed you decide to get. In truth, before this entry, all I ever did was take my roast chicken remnants, and boil them for hours with whatever herbs I had sitting around, cool it, strain it, bag it, and freeze it. But after doing some more research, I think I’m gonna start getting fussy! Frozen chicken bits, onion, celery, and carrot before adding water. I usually wait until I have 2 chickens’ worth of bones collected (I ghoulishly demand my dinner guests’ bones back on the regular) in the freezer before I start boiling. Bear in mind, you can do this with beef and pork bones as well, and I highly recommend it with oxtail. And fish stock is something we’ll discuss later, but more than likely, you’ll be running into more chicken bones, and chicken broth and stock are milder and more flexible when used in other dishes. I’ve also read that you get more gelatin from previously uncooked bones, but more flavor with roasted bones. I leave it to your discretion, dear reader. An ENORMOUS pot is the tool for this process. “Toddler boiling size,” as my friend Twyla would say. You’re going to dump in all your bones and leftover herbs and garlic and onions into the pot and cover them with water. Then set them on a burner on high and go get caught up on dog shaming. You’ll want to check in regularly while it’s boiling and doing its thing. if there’s any foamy gunk on top, skim it off with a mesh sieve or a ladle as best you can. If the water gets low, add more. This is a 4-12 hour process depending on how crazy you’re feeling. 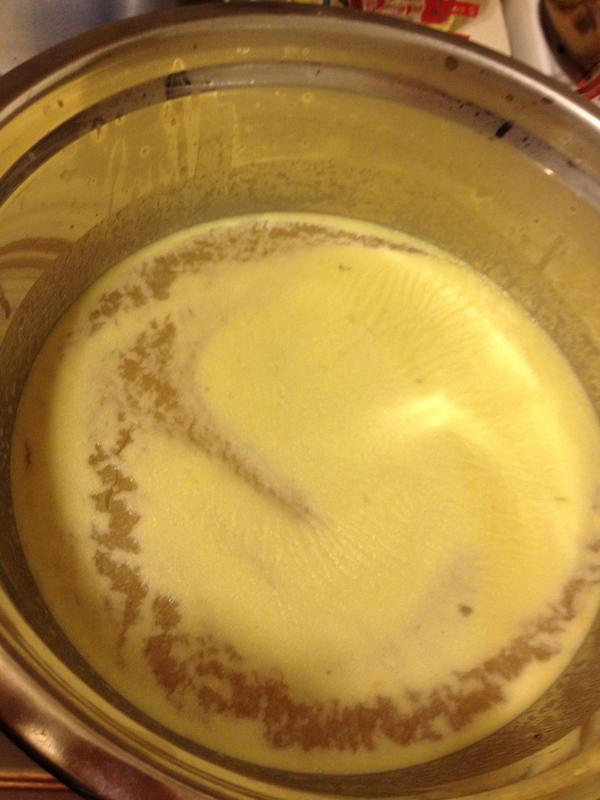 Cooled, gelled stock before scraping off the fat. After you’ve watched the complete opus of Law & Order: SVU, take your stock off the heat and carefully pour it through a mesh sieve away from you (nobody needs steam burns on the face) into another heat-proof (i.e. not plastic) container. Allow this to cool to room temperature before transferring to the refrigerator. 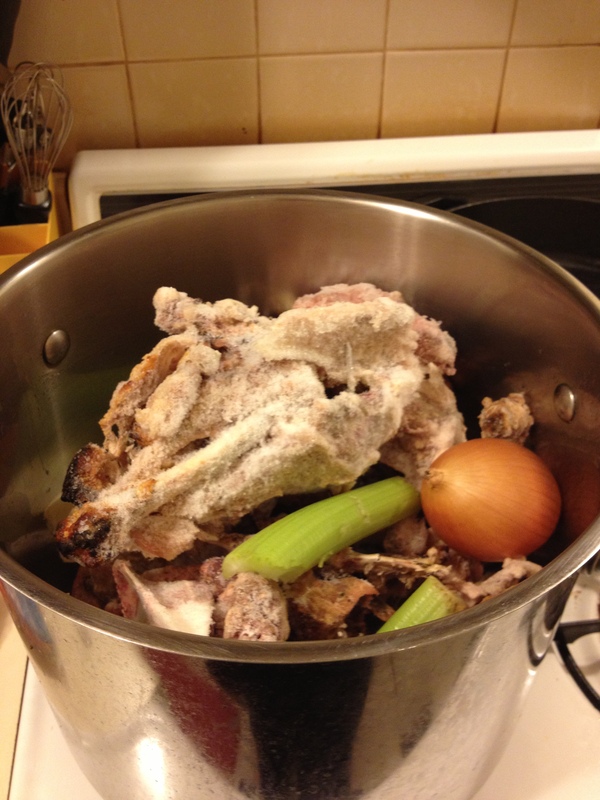 Once it’s cooled in the refrigerator for a while, you should be able to scrape any lingering fat off the stock, as it’ll have risen to the top and solidified in the fridge. This is another turning point for the fussy vs. non-fussy. You could warm up the stock (high-gelatin content stock will gel in the fridge) and pour it through a cheesecloth-lined sieve or funnel to further remove flotsam and jetsam. Depending on how quickly you go through stock, I recommend dividing it up into a small amount in the fridge and then 1 or 2 cup portions in freezer safe containers (I like to use zip lock bags and shelve them like books once they’re solid). You can also put your stock into an ice cube tray and then bag for smaller portions. And always remember to label and date your stock!